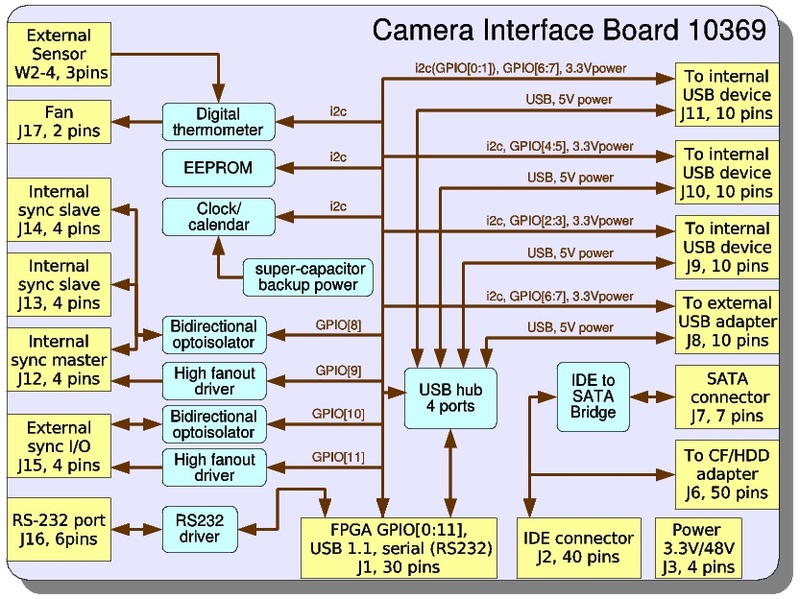 10369 interface board is an extension board for the Elphel 353/363 series cameras. 103693 - USB type A (host) connector adapter mounted on the back panel of the Elphel Model 353 camera. 103695 - IMU adapter board. 103696 - Serial GPS with synchronization signal adapter board. It can be impossible to mount an external SATA disk to the camera with an internal 18"HDD (NC353L-369A-HDD) as the internal disk (Toshiba MK1214GAH) does not react on master/slave-option bus and also it doesn't tristate the signals it shares with the SATA bridge. This combined port/EEPROM chip for the board identification and it also controls some IDE-related parameters of the board. The 8-bit port is bidirectional with weak pull up (strong pull up during write pulse), so to work as input bit has to be programmed with "1". There is a single "register" that corresponds to I/O bits that does not have any address, so a raw mode is used during I2C read/write. Default value after power up is 0xff (all bits "1"). Note: rebooting the camera does not reset the port - values are preserved. 6 OUTPUT DIS_SPREAD disable spread spectrum in SATA (default). The 10369 board's built-in temperature sensor measures on-chip ("system") temperature. It can also be configured to measure the temperature of an additional sensor (any general purpose small transistor) soldered to the pads W2-W3, as detailed below in the 'Connectors' section. The same circuit can also be used to automatically control a 3.3V or 5.0V fan (connected to J17), based on the output of either the internal or optional external temperature sensor. To configure the fan controller to run off the internal temperature sensor, terminals W2 and W3 should be soldered together. 10369 has on-board clock/calendar with the backup power provided by the supercapacitor (1.0F x 2.5V) - it should enable clock to run for several weeks if the camera is left without power. "System clock is set to Tue Jul  1 01:01:53 UTC 2008"
"Set system time error (probably CMOS clock is not set)"
In that case the clock/calendar should be set. Work in the same way as "fromCMOS" but without modification of camera system time. Note: +/- 48V are non-regulated input power rails. For 12V or 24V camera modifications these lines will also have +/-12V or +/-24V. Note: J4 is normally not installed. It is used in some camera modificatios where ther is another board on top of the 10369 that needs power - J4 is located oppposite to J3, same as on 10353 system board. Note: J5 is normally not installed. It may be used in multi-camera systems to provide 3.3V from the commomn to all camera modules power supply (DC-DC converter on 10353 should not be installed). Note: Connect J12 to J14 on the next camera in chain with a 4-conductor flex jumper, then from J13 of that next camera to the next in chain's J14, and so on. J12 and J13 have contacts on the bottom side, J14 - on the top to simplify chaining. Note: Connect J12 to J14 of the next camera module in chain. Note: In order to synchronize multiple cameras connect the pins 2 on all cameras together, same for all the pins 3. Additionally connect pin 1 on the 'master' (synchronization source) camera to pin 3, pin 4 - with pin2. Note: Default configuration supports 3.3VDC fans, in order to switch to 5.0V you need to open (cut trace) jumper JP2 and close (solder together terminals of) jumper JP1. Note: To make a simple temperature sensor for this circuit, a small NPN or PNP transistor can be used. It is best to use a shielded, twisted pair cable to connect the external sensor to the terminals on the 10369 board. Start by soldering the shield wire to GND on W4. Then solder together the base and the collector of the sensor transistor. If using an NPN transistor (i.e. 2N3904), solder one wire from the transistor's base to W2, and the other wire from the emitter to W3. 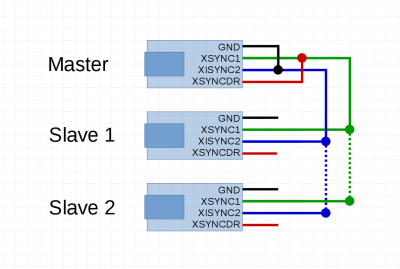 If using a PNP transistor (i.e. 2N3906), solder one wire from the transistor's emitter to W2, and the other wire from the base to W3. If no external sensor is used, but a temperature controlled cooling fan is needed, W2 and W3 should be connected together. This will allow the 10369 board's built in fan control to set the fan speed based on the board's internal temperature sensor. This page was last modified on 20 January 2015, at 14:46.